Museums at Night, the UK’s after-hours festival of arts, culture and heritage, produced by arts charity Culture24 is back for 2017. Now in its ninth year, the festival will take place in May and in October. Dates for the 2017 festivals are 17 – 20 May and 26 – 28 October respectively. Bullet PR is proud to have worked with the festival as their retained PR agency for the past 7 years. During the festival, hundreds of museums, galleries and historic spaces all over the UK will open their doors after dark to put on an impressive and diverse array of special night-time events – gallery gigs, art happenings, twilight screenings, all-night sleepovers, nature walks, star gazing or simply to offer the chance to experience some of the UK’s cultural venues, historic houses and museums in a new light. There are some fantastic highlights from the upcoming festival – including Fashion and Scandal: 1960’s Archive Night London. From the Profumo affair, to mods and rockers and the cultural, sexual and social revolutions, the National Archive will be showcasing records including those charting the rise of The Beatles, the trial of Lady Chatterley’s Love and the arrest and trial of the Krays. Expect expert talks, performances, music and dancing reflecting some of the biggest events of the decade. Bullet PR have been appointed by The Arts Foundation to work on the PR for the Arts Foundation Awards 2017. The Arts Foundation supports emerging artists across a range of artforms. Six awards, totalling £78,000 were given for 2017. The winners were Joanna Walsh for Creative Non-Fiction, Sam Stevens for Essay Filmmaking , Max Frommeld for Furniture Design, Lauren Kinsella for Jazz Composition, Ivan Ifekoya for Live Art and Julian Melchiorri for Materials Innovation. The winners were presented with their awards by guest of honour Will Self at ceremony that took place at Conway Hall, London. Joanna Walsh: Winner Creative Non-Fiction & Will Self. Previous winners have included film director Carol Morley (2003) and BAFTA award-winning director Asif Kapadia (2001), writers Ali Smith and Michel Faber and Artistic Director of the National Theatre Rufus Norris (Theatre Directing 2002). Since the inception of its Fellowship Scheme, over £1,700,000 has been awarded by The Arts Foundation, supporting numerous artists from the fields of Performing and Visual Arts, Crafts, Literature, New Media, Film and Design. Bullet PR are proud to announce we will be working with Brighton Museum and Art Gallery this year – supporting the museum on the launch of Fashion Cities Africa, the first major UK exhibition dedicated to contemporary African fashion. The exhibition will explore fashion and style in four cities at the compass points of the African continent – Lagos in Nigeria, Nairobi in Kenya, Casablanca in Morocco and Johannesburg in South Africa and will consider recent and contemporary fashion practices in these distinctive metropoles, from couture to street style. Apparel by Maki Oh, the internationally acclaimed Lagos-based label worn by Beyonce, Solange Knowles and Michelle Obama. Fashion Cities Africa opens on April 30th and runs until January 2017. 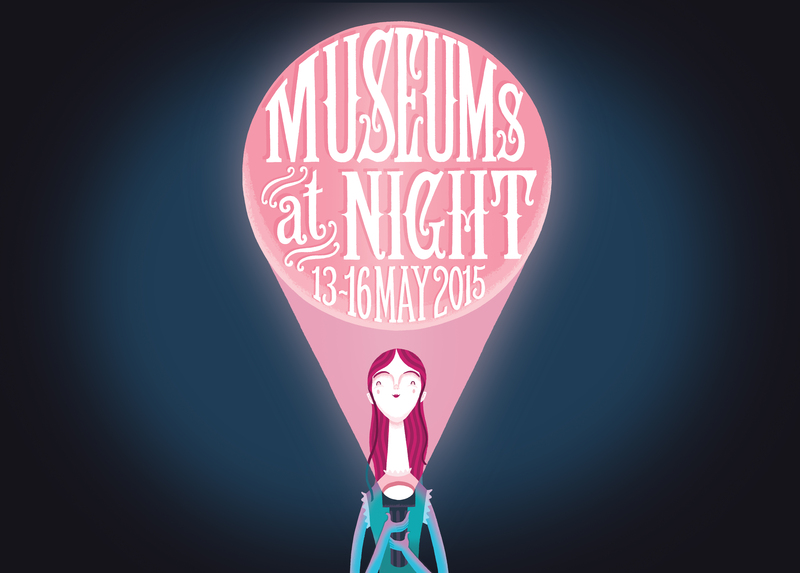 The Museums at Night festival went off with a bang this May with museums and galleries all over the UK opening up at night-time to put on a dazzling array of events. We saw a Freedom of Expression night featuring Saul Williams, Tongue Fu and Norman Jay MBE at the British Library, midnight cocktail apothecary sessions at the Brunel Museum, the medieval runs of Tintern Abbey in Wales illuminated for a special night of star gazing and hundreds of free events taking place across Liverpool as part of the LightNight festival. And of course sleepovers galore! 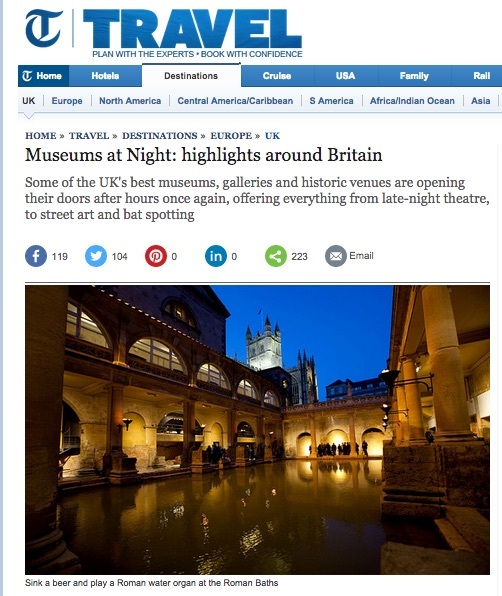 Museums at Night is a wonderful celebration of arts, culture and heritage in Britain and the best news? It’s happening again later this year, on October 30th & 31st. Bullet PR achieved some great coverage for the event with no less than three features in The Guardian and stories running across the nationals in The Daily Telegraph, The Times, The Daily Mirror, Daily Express, Evening Standard, The Independent and the Metro. We also secured radio interviews across the country, a story on the BBC Travel Show and a plethora of consumer magazines such as Time Out, online features in publications such as SheerLuxe and hundreds of regional press to boot. 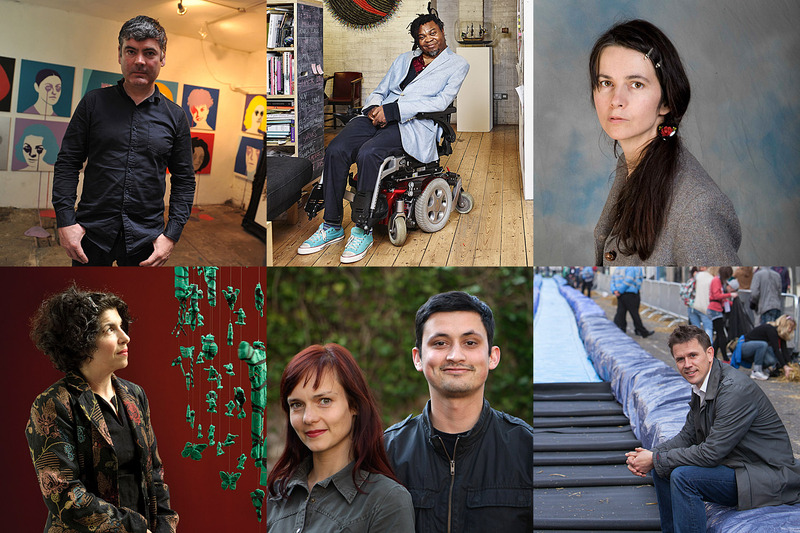 The six contemporary artists chosen for Museums at Night’s Connect! competition have been revealed. Connect! is the national competition that gives members of the public the chance to win a leading contemporary artist to create a unique event at their local museum or gallery during Museums at Night, the UK’s after hours festival of arts, culture and heritage. Cultural venues now have a five weeks to ‘bid’ for their chosen artist by coming up with a fantastic participatory event idea. The best ideas will be shortlisted by the artist and it’s then up to the public to vote for who goes where. The winning Connect! events will take place during Museums at Night’s new two-day October festival (October 30/ 31). Previous participating artists have included Bob & Roberta Smith, Jake and Dinos Chapman, Gavin Turk, Jessica Voorsanger and photographer Rankin. Previous events have included a Grayson Perry teddy-bear hunt around York Museum, New York artist Spencer Tunick photographing 100 nudes on Folkestone beach and Bompas & Parr floating the Bristol’s ss Great Britain on a sea of lime green jelly. In 2014, the Connect! competition attracted more than 62,000 public votes. The McGuires head an award winning creative studio that designs unique visual experiences through art installations and theatrical projects. Their hybrid art works are delicate, filigree fantasies that are momentarily brought to life through projection mapping and storytelling. Born in Birmingham in 1963, British artist Gillian Wearing investigates the tensions between public and private, fiction and reality, and the relationship between the artist and the viewer. Her performative photographs and films explore personal revelations, private fantasies, and psychological trauma. Drawing on theatrical techniques, fly-on-the-wall documentaries, and reality TV, her work explores public personas and private lives in an investigation of the way in which we present ourselves to the external world. In 1997 Wearing was awarded the prestigious Turner Prize. Luke Jerram’s multidisciplinary practice involves the creation of sculptures, installations and live arts projects. Jerram has created a number of extraordinary art projects which have excited and inspired people around the globe. Shonibare’s work explores issues of race and class through the media of painting, sculpture, photography and film. Having described himself as a ‘post-colonial’ hybrid, Shonibare questions the meaning of cultural and national definitions. His trademark material is the brightly coloured ‘African’ batik fabric he buys at Brixton market. The fabric was inspired by Indonesian design, mass-produced by the Dutch and eventually sold to the colonies in West Africa. In the 1960s the material became a new sign of African identity and independence. British designer Bernard Lodge, best known for his work designing the early Doctor Who title sequences, has been chosen to design the artwork for this year’s Artists Open Houses Festival. Bernard designed the first four series logos and the first five title sequences for Dr Who before going on to work on the effects for Ridley Scott’s Alien and Bladerunner, one of the first people to work on designing computer effects. Since then he has moved to more traditional art forms and now creates bright and bold woodcuts from his studio near Brighton. Bernard will be exhibiting some of his woodcut prints, along with last year’s Artists Open Houses Artist of the Year winner Tony Bowen at The Old Market in Hove and at the Salon Des Sources in Hove. The 2015 Artists Open Houses festival will take place in Brighton, Hove and beyond over the four weekends of May, starting May 2. It is the largest event of its kind in the UK, with approximately 200 houses and studio spaces across the city opening their doors to exhibit the work of over 1,000 artists and makers. 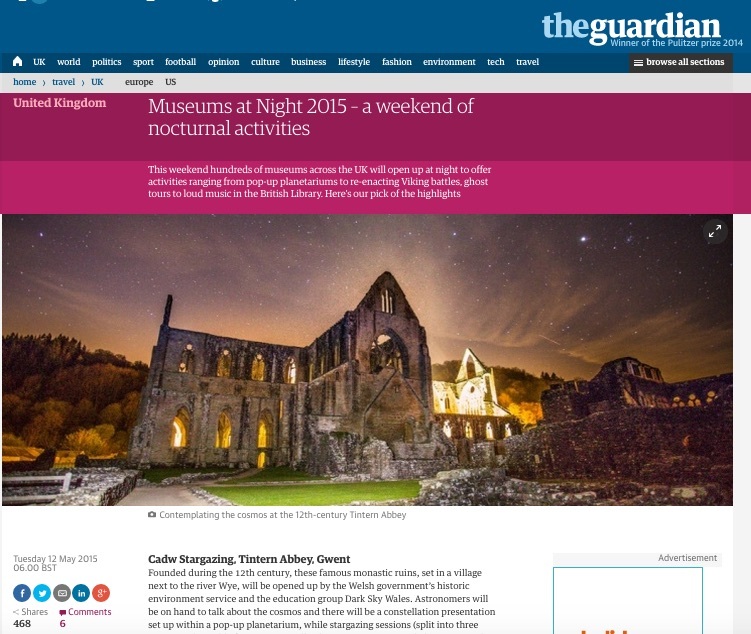 After a bumper year in 2014, Museums at Night – the UK’s annual night-time festival of arts, culture and heritage – will now take place twice a year– in May and October. The May festival will now run over four days, from Wednesday May 13 until Saturday May 16, while a second festival, lasting two days, will take place on Friday and Saturday, October 30 and 31. Now in its seventh year, Museums at Night offers the chance to experience culture and heritage in a totally unexpected way. The festival sees hundreds of museums, galleries and historic spaces all over the UK opening their doors after hours to put on an array of special events. The festival has experienced phenomenal growth during the past few years, attracting 180,000 visits to 700 events in more than 500 venues across the country in 2014.